TIM PINNING. DHYP, CUR. HYP, GHR, GHSC, ADV, DIPH, SQHP, ADPR, NLP, MASC, PTH, CNHC, GQHP. HYPNO- SLIMMING PROGRAMME - lose weight the easy way. The Peterborough Curative Hypnotherapy Clinic has been established in Peterborough since 2005, and due to the high demand for hypnosis and the excellent results achieved, moved to new premises in 2010. The new Peterborough Hypnotherapy Clinic is based at 26, Priestgate, Peterborough City Centre, where we are able to offer a more professional and relaxed service to all our old and new clients. Offering Hypnotherapy, Psychotherapy, Neuro-Linguistic Programming and Counselling. The Peterborough Curative Hypnotherapy Clinic has continued to grow, helping many clients to achieve their goals. The success of the clinic has led to Tim opening a second Curative Hypnotherapy Clinic in the prestigious, Harley Street. The Harley Street Curative Hypnotherapy Clinic London W1G 9PA. We are now able to offer Hypnotherapy at both Clincs. Tim is the only Senior Advanced Registered Hypnotherapist in the Peterborough area who has been awarded the higher status of: Senior Advanced Hypnotherapist (ADPR,SQHP) by the General Hypnotherapy Register (GHR) this grade recognises all the extra work, skills, experience and commitment Tim has achieved. 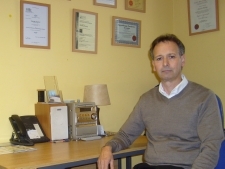 There are only around 10 Hypnotherapist in the UK to have been awarded the status of Senior Advanced Registered Hypnotherapist by the GHR, Tim is one of the more highly qualified and experienced, Senior Advanced Registered Hypnotherapists seeing clients at Peterborough Hypnotherapy Clinic and Harley Street. Tim is also a registered Supervisor for the General Hypnotherapt Register (GHR) the largest register of hypnotherapists in the UK. The Peterborough Hypnotherapy Centre will be opening a new Hypnotherapy Training Centre in 2015, The Peterborough Curative Hypnotherapy Training Centre. The Peterborough Hypnotherapy Training Centre will be holding, Continued Personal Developement Classes, (CPD) and Supervision Classes (to start in 2019). Tim has over 35 years experience working in the training industry, during this time he has trained beginers right through to training the trainers at a more advanced level. The Peterborough Hypnosis training centre is now able to offer qualified hypnotherapist the opportunity to purchase the unique programmes or attend workshops for training. While working at the Peterborough Hypnotherapy Clinic, Tim has developed proved and tested hypnotherapy programmes to help his clients. Programmes such as the Weight Loss programme, Hypno-Slimming Programme including the Hypnotic Gastric Band, Anxiety Management, Anger Management, Stress Management, Insomnia Programme, Addictions Management Programme, Pain Relief Programme. Over the past 14 years the Peterborough Hypnotherapy Clinic has acheived excellent results on clients who have attended the Hypnotherapy Clinic. The programmes cover the information required for a course of four sessions. This includes information booklets for the Hypnotherapist to use with the client during the sessions plus all the scripts, The programmes can be adapted for each individuals clients needs and then tailored to the clients own issues. The programmes can also be extended if require. 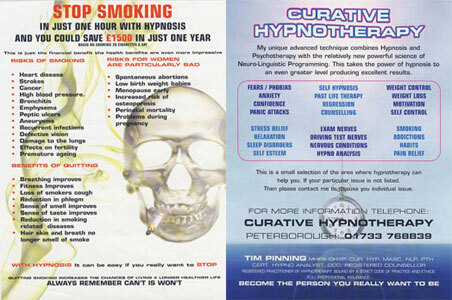 For more information on purchasing any of the above programmes contact: Tim Pinning at the Peterborough Curative Hypnotherapy Clinic. Tim specialises in all weight issues, including the Hypno-Slimming Programme and the Hypnotic Gastric Band. Other speacialist areas offered, that The Peterborough Hypnotherapy Clinic can help with are for: Anxiety, Panic Attacks, Addictions, Confidence, Smoking Cessation, Fears, Phobias, Insomnia, Pain Management, Habits, IBS, Anger Management, Exam Nerves, Driving Test, Nerves, Motivation, Relaxation, Public Speaking, Weight Control, Hypnotic Gastric Band. The Peterborough Hypnotherapy Clinics also offer hypnotherapy for many other issues. If your particular issue isn't listed then please contact the clinic to see how we can help. As well as helping clients on a one to one basis. The Peterborough Hypnotherapy Clinic can now offer Small Group Sessions for 2 to 5 clients. This can reduce the cost of each session considerably. Get together with your friends, family or work colleagues and book in for one of the group hypnotherapy programmes. The group sessions greatly reduce the cost of hypnotherapy making it more accessible to more clients. The cost of each group sessions can start, from only £25 per person. The Peterborough Hypnotherapy Clinic can also take referrals from your GP. For companies that feel they may be interested please in the group sessions or would like more information, please contact the Peterborough Hypnotherapy Clinic. Some company health insurances will cover all the costs. Tim holds qualifications in the following. Member of the General Hypnotherapy Register. The main aim of the Peterborough Hypnotherapy Clinic is to help people with the many different and sometimes complex issues surrounding their life. Since forming the Peterborough Hypnotherapy Clinic in 2005, The Peterborough Hypnotherapy Clinic has helped many people in the Peterborough area with hundreds of different issues. Clients have been able to see for themself how hypnosis has helped them and how they have benefited from its use. The Peterborough Hypnotherapy Clinic has helped clients from all over Europe, which include: France, Spain, Portugal, Sweden, Ireland, poland, Greece, Italy. The clients the Peterborough Hypnotherapy Clinic has helped come from all walks of life, Doctors, General Practitioners, CEO, Solicitors, Electricians, Refuge Collectors, Teachers, Plumbers, Office Workers, Builders, Business Owners, Midwifes, Nurses, Teachers, plus many more. Hypnosis is possibly as old as man kind. Old myths and misconceptions about hypnosis have given way to proven, scientifically-sound application, today the use of hypnosis is seen in a variety of fields, including medicine, dentistry, law enforcement, professional sports and education. Most people have a limited understanding of the positive results hypnosis can achieve when used by a professional hypnotherapisy during the hypnosis session. Hypnosis can benefit you in many ways it helps bring back a balance to your life. Below are some of the issues where hypnosis can help, please go to 'find your issues page' to see a more detailed list. The Peterborough Curative Hypnotherapy Clinic is in easy reach from Spalding, Bourne, Huntingdon, Yaxely, Oundle, Deeping, Cambridge, March. Whittelsey, Cambridgeshire, Lincolnshire, Rutland, Hunstanton, Stamford, Chatteris, Wisbech. The Peterborough Curative Hypnotherapy Clinic is based just five minutes walk from the railway station, and five minutes from the bus station. My unique advanced technique combines Hypnosis and psychotherapy with the relatively new powerful science of Neuro-Linguistic Programming. This takes the power of hypnosis to an even greater level producing excellent results. This is a small selection of the areas where hypnotherapy can help you. If your particular issue is not listed. Then please contact me to dicuss you individual issue. SQHP. GHQP. GHR. GHSC. DHYP. CNHC. BSYA. CUR. HYP. MASC. NLP. PTH. CERT. HYPNO ANALYST. CCC. REGISTERED COUNSELLOR.